An ocean (from Greek , "okeanos" Oceanus) is a major body of saline water. The ocean covers 71 percent of the Earth's surface and contains 97 percent of the planet's water, yet more than 95 percent of the underwater world remains unexplored. The ocean and lakes play an integral role in many of the Earth's systems including climate and weather. The ocean supports the life of nearly 50 percent of all species on Earth and helps sustain that life providing 20 percent of the animal protein and five percent of the total protein in the human diet. Today 71% of the Earth is covered with water, 29% by the 7 continents. The percentage covered by water will increase as the Earth continues to warm and polar ice caps melt. The great body of water embracing the continents of the Earth is also known as the world ocean. Its major subdivisions are the Pacific, the Atlantic, the Arctic, the Indian, and the Southern oceans. More than one-half of the world's population lives within 60 miles (100 km) of the ocean. In ancient times, the term seven seas was used to describe all known large bodies of water. These were: the Indian Ocean, the Red Sea, the Persian Gulf, the Black Sea, the Sea of Azov, the Adriatic Sea, and the Caspian Sea. Today, the term seven seas is used to refer to the Arctic, Antarctic, North Pacific, South Pacific, North Atlantic, South Atlantic, and Indian Oceans. The highest tides in the world are at the Bay of Fundy, which separates New Brunswick from Nova Scotia. At some times of the year the difference between high and low tide is 53 feet 6 inches, the equivalent of a three-story building. Canada has the longest coastline of any country, at 56,453 miles or around 15 percent of the world's 372,384 miles of coastlines. A slow cascade of water beneath the Denmark Strait sinks 2.2 miles, more than 3.5 times farther than Venezuela's Angel Falls, the tallest waterfall on land. Although Mount Everest, at 29,028 feet, is often called the tallest mountain on Earth, Mauna Kea, an inactive volcano on the island of Hawaii, is actually taller. Only 13,796 feet of Mauna Kea stands above sea level, yet it is 33,465 feet tall if measured from the ocean floor to its summit. This surface layer is also called the sunlight zone and extends from the surface to 660 feet (200 m). It is in this zone that most of the visible light exists. With the light comes heating from sun. This heating is responsible for wide change in temperature that occurs in this zone, both in the latitude and each season. The sea surface temperatures range from as high as 97°F (36°C) in the Persian Gulf to 28°F (-2°C) near the north pole. The sea surface temperature also "follows the sun". From the earth's perspective, the sun's position in the sky moves higher each day from winter to summer and lower each day from summer to winter. This change in the sun's position from winter to summer means that more energy is reaching the ocean and therefore warms the water.Interaction with the wind keeps this layer mixed and thus allows the heating from the sun to be distributed vertically. At the base of this mixing layer is the beginning of the thermocline. 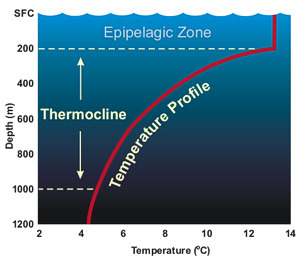 The thermocline is a region where water temperature decreases rapidly with increasing depth and transition layer between the mixed layer at the surface and deeper water. The depth and strength of the thermocline varies from season to season and year to year. It is strongest in the tropics and decrease to non-existent in the poler winter season. Below the epipelagic zone is the mesopelagic zone, extending from 660 feet (200 meters) to 3,300 feet (1,000 meters). The mesopelagic zone is sometimes referred to as the twilight zone or the midwater zone as sunlight this deep is very faint. Temperature changes the greatest in this zone as this is the zone with contains the thermocline. The depths from 3,300 - 13,100 feet (1,000-4,000 meters) comprise the bathypelagic zone. Due to its constant darkness, this zone is also called the midnight zone. The only light at this depth (and lower) comes from the bioluminescence of the animals themselves. 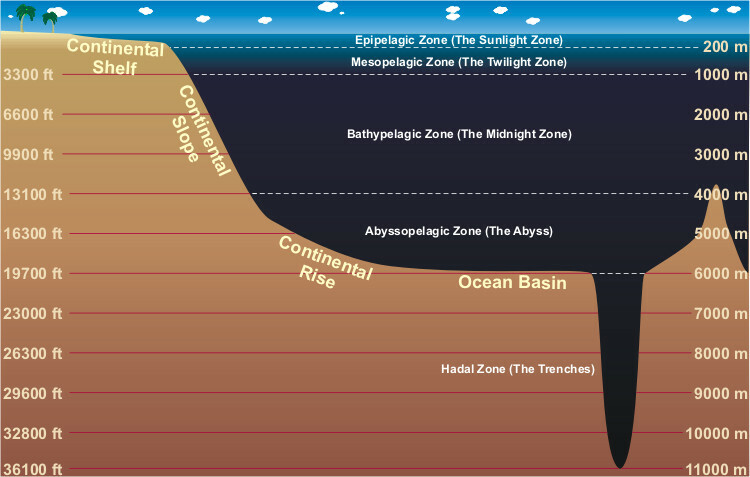 The Abyssopelagic Zone (or abyssal zone) extends from 13,100 feet (4,000 meters) to 19,700 feet (6,000 meters). It is the pitch-black bottom layer of the ocean. The name (abyss) comes from a Greek word meaning "no bottom" because they thought the ocean was bottomless. Three-quarters of the area of the deep-ocean floor lies in this zone. The water temperature is constantly near freezing and only a few creatures can be found at these crushing depths. The deepest a fish have ever been found was in the Puerto Rico Trench at 27,460 feet (8372 meters). The deepest zone of the ocean, the hadalpelagic zone extends from 19,700 feet (6,000 meters) to the very bottom at 35,797 feet (10,911 meters) in the Mariana Trench off the coast of Japan. The temperature is constant at just above freezing. The weight of all the water over head in the Mariana Trench is over 8 tons per square inch (the weight of 48 Boeing 747 jets). Even at the very bottom life exists. In 2005, tiny single-celled organisms, called foraminifera, a type of plankton, were discovered in the Challenger Deep trench southwest of Guam in the Pacific Ocean. The three major ocean basins are the Atlantic, Indian, and Pacific Oceans . These lie over oceanic crust and have an average depth of about 3800 meters. The Atlantic Ocean is the youngest of the three and is dominated by a central oceanic ridge and by abyssal plains of fine sediment. It has grown during the past 200 million years at the expense of the Pacific Ocean. The ocean province ranges from shallow coastal areas to the deepest ocean environments. Many of the ocean features have been named and the particular provinces described. The major features are discussed in the following sections. The oceanic ridge system is the most pronounced tectonic feature on Earth. The combined ridges are more than 60,000 km in length, with an area of 23% of the earth's surface, almost equal to the total area of the continents. These ridges extend as an almost continuous feature around the globe in the form of spectacular mountain ranges of volcanic basalts. The ridges are arched up and broken by numerous fault blocks to form linear hills and valleys. A prominent rift valley marks the crest of the ridge throughout most of its length. The general character of the ridge is a function of the rate of plate separation. A slow rate of spreading produces a higher and more rugged oceanic ridge than when the spreading rates are more rapid. Rift valleys are also more prominent on ridges between slow moving plates. The rift valley along the center of the rise is a zone of shallow earthquakes. The system is not restricted to the oceans -- it emerges in continental areas in Africa, California, and in Iceland . Numerous open fissures have been observed and mapped in the rift valleys, which is evidence that the crust is being pulled apart along the ridge. The eruption of lava from these fractures parallels the rift valley and creates long narrow ridges. The oceanic ridge is cut by faults normal to the ridge. Although these are strike-slip faults, vertical displacement may form abrupt cliffs that can be traced for many kilometers . Horizontal movement on these transform faults is on the order of 1-2 cm/yr and the faults are marked by earthquake activity and vulcanism. The magnitude of the system and its nature indicates that it is related to major events and sources of energy in the Earth's interior. The abyssal hills have relatively low relief as they rise only 75 to 900 meters above the ocean floor. Abyssal hills were formed as oceanic ridge. As the crust moves away from the spreading center, it cools and sinks to a lower depth. The mountainous terrain of the oceanic ridge is maintained, becoming low-lying abyssal hills at depths of more than 6,000 meters. The hills are usually covered with a blanket of unconsolidated pelagic sediments deposited with reasonable uniformity which gradually modifies and smoothes the features but do not change the original volcanic ocean floor topography that formed at the ridge. A flat featureless surface known as an abyssal plain occurs when the hilly sea floor has been covered by a thick fill of sediments, which were deposited by turbidity currents. These river-like flows of a sediment water mix are carried along the sea floor. They receive sediments from continental margin submarine canyons which act as conduits for turbidity current transport. The original irregular surface of a volcanic province remains under the turbidite fill. These plains, which may slope less than 1:8000, are found adjacent to land masses -- extending from the continental rise to the abyssal hills. On prominences that rise above the plain, only sediments settling in the water column (pelagic deep-sea sediments) occur. On the surface of the plain, the pelagic sediments are interbedded with a dominating sequence of sands, silts, and clays of terrigenous origin that can be identified as turbidites by displaced benthic fauna and sediment patterns characteristic of turbidites. A subduction zone, where two lithosphere plates converge and one slab of plunges into the mantle, is expressed topographically by a trench. Deep-sea trenches are long, narrow depressions in the ocean floor with depths greater than 6000 meters and they can reach 11,000 meters in depth. Trenches are found adjacent to land areas and associated with island arcs worldwide, but they are more numerous in the Pacific Ocean. The trench is usually asymmetric, with the steep side toward the adjacent land mass. Where a trench occurs off continental margins, the turbidites from the slope are trapped, forming a hadal plain on the floor of the trench. Volcanic cones reaching the ocean surface form volcanic islands . Subsidence of a volcanic island with growth of coral keeping pace as it subsides will result in the formation of an atoll . Drowning of ancient volcanic islands by isostatic adjustment is shown by the coral atoll deposits drilled in the Pacific. More than 1400 meters of shallow water carbonates -- deposited in less than 100 meters water depth -- have been recovered from Bikini Atoll. Guyots and seamounts are geomorphic forms developed from submarine volcanoes. Seamounts and guyots are isolated, but they do lie in chains or provinces of volcanic activity. They are found in all oceans, but more have been recorded in the Pacific Ocean. The distribution that has been mapped may represent a small percent of the total number since they are only noted where crossed during bathymetric profiling. The seamount is a relatively isolated elevation of the seafloor of more than 1000 meters height, with a small rounded top -- a volcano that did not reach the sea surface. Guyots are drowned volcanic islands that did not become coral atolls. They were planed flat by wave action when at shallow depths, after which subsidence occurred so that they are like seamounts but with a flattened top that lie more than 200 meters below the surface. Although some coral rubble may be found on guyots, they are abrasional platforms that have subsided as a result of isostatic adjustment, with some contributing effect from sea level change. Everything from earthquakes to ship wakes creates waves; however, the most common cause is wind. As wind passes over the water's surface, friction forces it to ripple. The strength of the wind, the distance the wind blows (fetch) and the length of the gust (duration) determine how big the ripples will become. Waves are divided into several parts. The crest is the highest point on a wave, while the trough, or valley between two waves, is the lowest point.Wavelength is the horizontal distance, either between the crests or troughs of two consecutive waves. Wave height is a vertical distance between a wave's crest and the next trough. Wave period measures the size of the wave in time. A wave period can be measured by picking a stationary point and counting the seconds it takes for two consecutive crests or troughs to pass it. In deep water, a wave is a forward motion of energy, not water. In fact, the water does not even move forward with a wave. If we followed a single drop of water during a passing wave, we would see it move in a vertical circle, returning to a point near its original position at the wave's end. These vertical circles are more obvious at the surface. As depth increases, their effects slowly decrease until completely disappearing about half a wavelength below the surface. In deep waters, only wavelength and wave period affect a waves speed. As the wave approaches shallow water, or water that is half the wavelength or less deep, the ocean floor begins to affect the wave's shape and speed. Wave height increases, and the crests become more peaked. As the steepness increases, the wave becomes unstable. The forward speed of the crest becomes faster than the speed of the wave, and the wave breaks. We can describe breaking waves in three different ways: Surging Breakers, Plunging Breakers and Spilling Breakers. You see examples of these at the beach. From "Ocean Talk" by Naval Meteorology and Oceanography Command. Surging Breakers happen on beaches where the slope is very steep. The wave does not actually break. Instead, it rolls onto the steep beach. These kinds of breakers are known for their destructive nature. Plunging Breakers happen on beaches where the slope is moderately steep. This kind of wave normally curls over forming a tunnel until the wave breaks. Expert surfers love this type of wave! Spilling Breakers occur on beaches with gentle slopes. These waves break far from the shore, and the surf gently rolls over the front of the wave. Around the world, there are some similarities in the currents. For example, along the west coasts of the continents, the currents flow toward the equator in both hemispheres. These are called cold currents as they bring cool water from the poler regions into the topical regions. The cold current off the west coast of the United States is called the California Current. These currents have a huge impact on the long-term weather a location experiences. The overall climate of Norway and the Bristish Isle is about 18°F (10°C) warmer in the winter than other cites located at the same latitude due to the Gulf Stream. 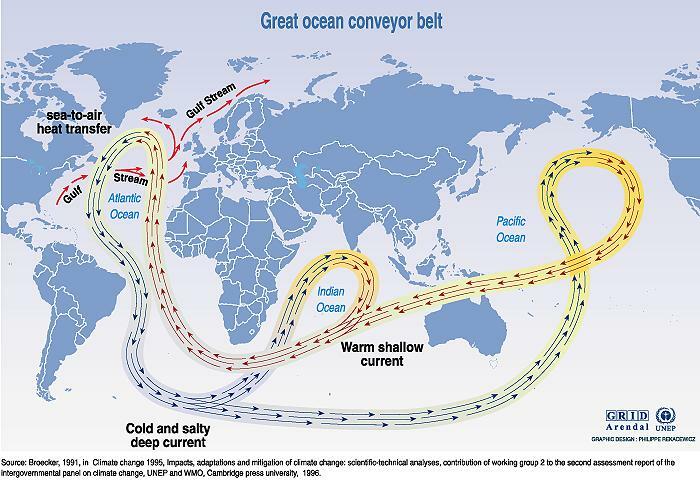 While ocean currents are a shallow level circulations, there is global circulation which extends to the depths of the sea called the Great Ocean Conveyor. 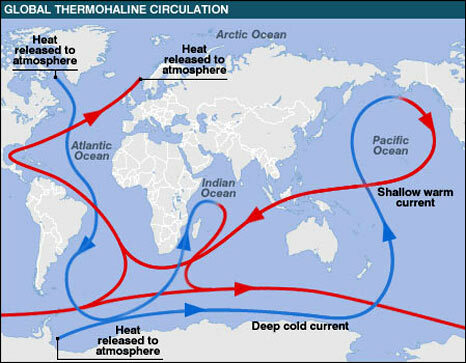 Also called the thermohaline circulation, it is driven by differences in the density of the sea water which is controlled by temperature (thermal) and salinity (haline). If the water is sinking in the North Atlantic Ocean then it must rise somewhere else. This upwelling is relatively widepsread. However, water samples taken around the world indicate that most of the upwelling takes place in the North Pacific Ocean. It is estimated that once the water sinks in the North Atlantic Ocean that it takes 1,000-1,200 years before that deep, salty bottom water rises to the upper levels of the ocean. The change in the water level with the daily tides from location to location results from a many factors. The oceans and shorelines have complex shapes and the depth, and configuration, of the sea floor varies considerably. As a result, some locations only experience one high and low tide each day, called a diurnal tide. Other locations experience two high and low tides daily, called a semi-diurnal tide. Still, other sites have mixed tides, where the difference in successive high-water and low-water marks differ appreciably. 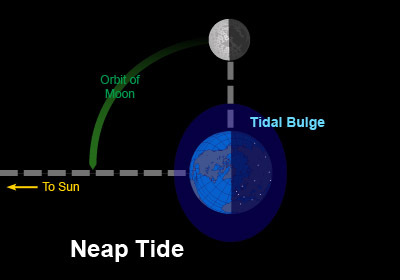 Another factor in the variation of tides is based on the orbit of the moon around the earth and the earth around the sun. Both orbits are not circles but ellipses. The distance between the earth and moon can vary by up to 13,000 miles (31,000 km). 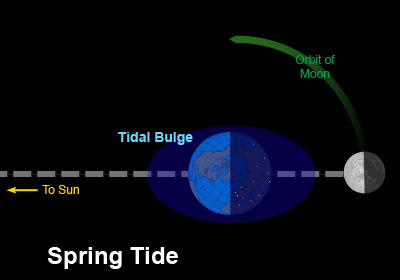 Since the tidal force increase with decreasing distance then tides will be higher than normal when the moon is at its closest point (called perogee) to the earth, approximately every 28 days. Likewise, the earth's elliptical orbit also causes variations in the sun's pull on the tides as we move from the closest point to the farthest point (called apogee) over the course of a year. And just to complicate things even more, the moon's orbit is inclined 5° to the earth's rotation. So the north/south orientations of the bulge also varies between the northern and southern hemisphere over this same 28-day orbital period. As the moon completes one orbit around the earth (about every 28 days), there are two times in each orbit when the earth, moon and and sun are inline with each other and two times when the earth, moon and sun are at right angles. When all three are inline (around full and new moons), the combined effect of the moon's and sun's pull on the earth's water is at its greatest resulting in the greatest ranges between high and low tide. This called a "spring" tide (from the water springing or rising up). The word is Japanese and means "harbor wave," because of the devastating effects these waves have had on low-lying Japanese coastal communities. The word tsunami (pronounced tsoo-nah'-mee) is composed of the Japanese words "tsu" (which means harbor) and "nami" (which means "wave").Tsunamis are often incorrectly referred to as tidal waves, but a tsunami is actually a series of waves that can travel at speeds averaging 450 (and up to 600) miles per hour in the open ocean. Tsunamis are a series of very long waves generated by any rapid, large-scale disturbance of the sea. Most are generated by sea floor displacements from large undersea earthquakes. Tsunamis can cause great destruction and loss of life within minutes on shores near their source, and some tsunamis can cause destruction within hours across an entire ocean basin. Different sources provide energy for these different types of motion. Surface and deep currents are powered by solar radiation. The energy source for the tides is gravitational attraction of the Earth and Moon. The Earth's internal heat provides energy for tsunamis. Wind and the rotation of the Earth are important in determining the flow of surface currents and local areas of upwelling and downwelling, but the true driving force of deep water movement is thermohaline circulation. Sometimes called the ocean conveyer belt, this mechanism is responsible for bringing the oxygen that sustains life to the deepest reaches of the sea, and in moving warmer waters from the tropics towards the poles. 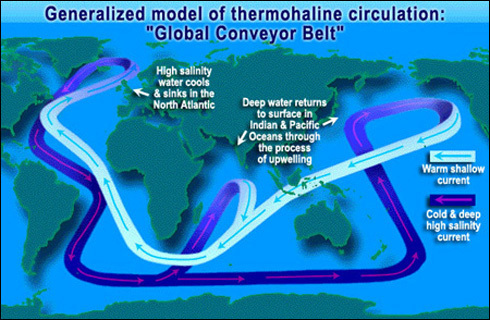 Movement of this conveyer belt depends on sinking of cold water in certain polar regions, thereby triggering the global thermohaline circulation. 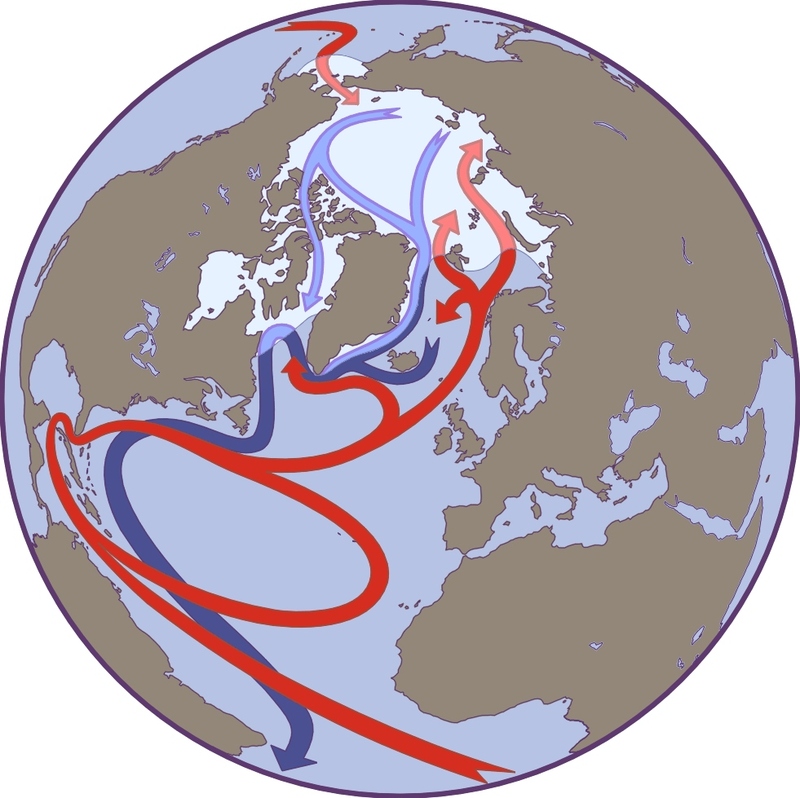 The Gulf Stream merges into the North Atlantic Current. This warm water then flows up the Norwegian coast, with a westward branch warming Greenland's tip, at 60°NIt keeps northern Europe about nine to eighteen degrees warmer in the winter than comparable latitudes elsewhere. Global warming could alter this. Because freshwater is less dense than seawater, increased precipitation, melting of polar glaciers and ice caps could block the system by reducing the amount of cold water that sinks downwards. In the Atlantic, warm, high-salinity water flows northward in the Gulf Stream along the east coast of North America. Some of this water continues northeastward in the North Atlantic Current toward Iceland and Norway. Off the coast of Greenland, a portion of the surface water cools, becomes dense, and sinks. A further portion of surface water continues into the Arctic Ocean before also cooling and sinking. Together these sinking plumes off Greenland and in the Arctic form "deep water" that plays an important role in global oceanic circulation. The two most common elements in sea water, after oxygen and hydrogen, are sodium and chloride. Sodium and chloride combine to form what we know as table salt. Sea water salinity is expressed as a ratio of salt (in grams) to liter of water. In sea water there is typically close to 3.5 grams of dissolved salts in each liter. It is written as 35‰ The normal range of ocean salinity ranges between 3.3-3.7 grams per liter (33‰ - 37‰). But as in weather, where there are ares of high and low pressure, there are areas of high and low salinity. Of the five ocean basins, the Atlantic Ocean is the saltiest. On average, there is a distinct decrease of salinity near the equator and at both poles, although for different reasons. Near the equator, the tropics receive the most rain on a consistent basis. As a result, the fresh water falling into the ocean helps decrease the salinity of the surface water in that region. As one move toward the poles, the region of rain decreases and with less rain and more sunshine, evaporation increases. Fresh water, in the form of water vapor, moves from the ocean to the atmosphere through evaporation causing the higher salinity. 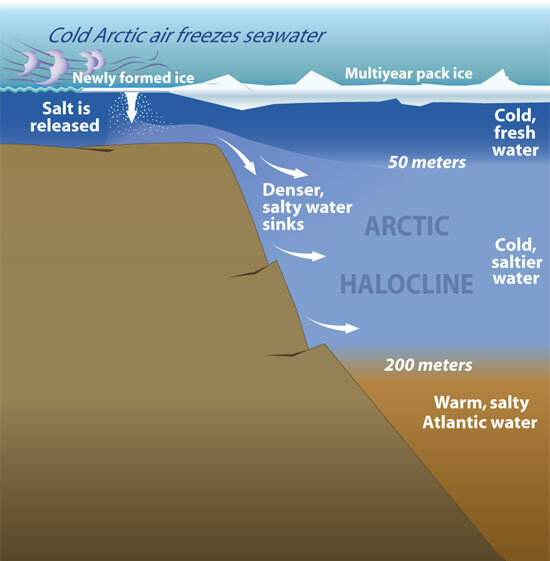 Toward the poles, fresh water from melting ice decreases the surface salinity once again. The saltiest locations in the ocean are the regions where evaporation is highest or in large bodies of water where there is no outlet into the ocean. The saltiest ocean water is in the Red Sea and in the Persian Gulf region (around 40‰) due to very high evaporation and little fresh water inflow. Salinity—the amount of dissolved salt in the water—is critical to so many aspects of the ocean, from circulation to climate to the global water cycle. 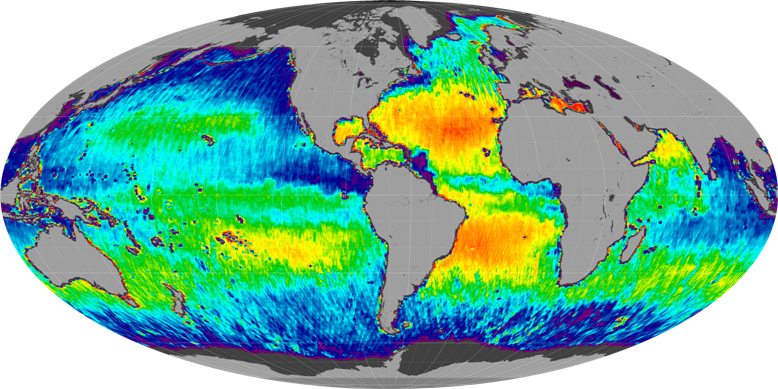 For the past year, NASA and Argentina’s Comisión Nacional de Actividades Espaciales (CONAE) have been making comprehensive observations of sea surface salinity from space. Launched on June 10, 2011, the Aquarius mission is slowly compiling a more complete picture of the salty sea and how it varies. Even though we do not feel it, 14.7 pounds per square inch (psi), or 1kg per square cm, of pressure are pushing down on our bodies as we rest at sea level. Our body compensates for this weight by pushing out with the same force. Since water is much heavier than air, this pressure increases as we venture into the water. For every 33 feet down we travel, one more atmosphere (14.7 psi) pushes down on us. For example, at 66 feet, the pressure equals 44.1 psi, and at 99 feet, the pressure equals 58.8 psi. Temperature, salinity and pressure work together to determine water density (weight of water divided by the amount of space it occupies). Cold, salty water is much denser than warm, fresher water and will sink below the less dense layer. The ocean waters can be divided into three layers, depending on their densities. Less dense waters form a top layer called the surface mixed zone. The temperature and salinity of this layer can change often because it is in direct contact with the air. For example, water evaporation could cause an increase in salinity, and a cold front could cause a drop in temperature. The next layer is the pycnocline, or transition zone. The density here does not change very much. This transition zone is a barrier between the surface zone and a bottom layer, allowing little water movement between the two zones. 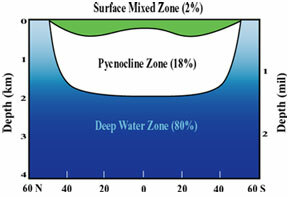 The bottom layer is the deep zone, where the water remains cold and dense. The polar regions are the only places where deep waters are ever exposed to the atmosphere because the pycnocline is not always present. Probably the most important and predominant pigment in the ocean is chlorophyll-a contained in microscopic marine plants known as phytoplankton. Chlorophyll-a absorbs blue and red light and reflects green light. If the ratio of blue to green is low for an area of the ocean surface, then there is more phytoplankton present. This relationship works over a very wide range of concentrations, from less than 0.01 ton early 50 milligrams of chlorophyll per cubic meter of seawater. Prior to the Industrial Revolution, the annual uptake and release of carbon dioxide by the land and the ocean had been on average just about balanced. In more recent history, atmospheric concentrations have increased by 80 ppm (parts per million) over the past 150 years. However, only about half of the carbon released through fossil fuel combustion in this time has remained in the atmosphere, the rest being sequestered the ocean. The ocean is a significant influence on Earth's weather and climate. The ocean covers 71% of the global surface. This great reservoir continuously exchanges heat, moisture, and carbon with the atmosphere, driving our weather patterns and influencing the slow, subtle changes in our climate. 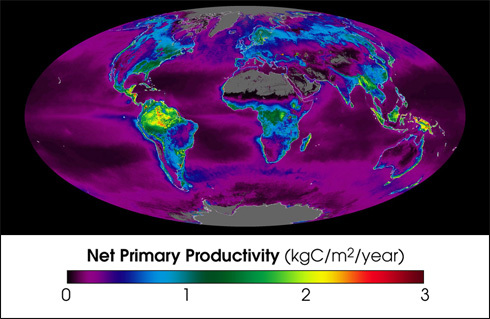 The oceans influence climate by absorbing solar radiation and releasing heat needed to drive the atmospheric circulation, by releasing aerosols that influence cloud cover, by emitting most of the water that falls on land as rain, by absorbing carbon dioxide from the atmosphere and storing it for years to millions of years. The oceans absorb much of the solar energy that reaches earth, and thanks to the high heat capacity of water, the oceans can slowly release heat over many months or years. The oceans store more heat in the uppermost 3 meters (10 feet) than the entire atmosphere. The oceans and the atmosphere form a closely linked "dynamic duo." Energy from the sun, plant distributions, and greenhouse gasses in the atmosphere can affect temperature and circulation patterns of this ocean-atmospheric duo. The sun is Earth's main source of energy. Solar energy is absorbed by both oceans and continents. Because the oceans cover over 71% of Earth's surface and are darker than the continents--they absorb more of the sun's energy. Oceans not only absorb lots of energy from the sun--they can also store lots of solar energy in the form of heat. And they can do this with very little change in temperature. Sunlight warms the surface of the ocean in the tropics. 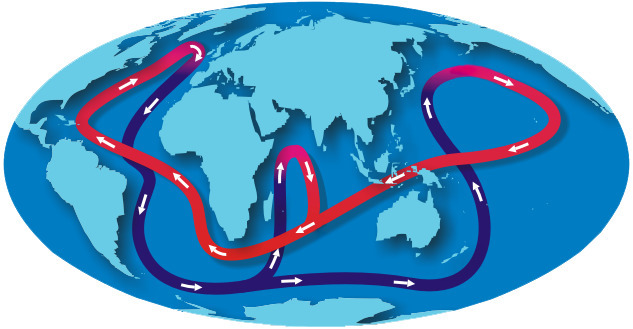 Wind-driven surface currents carry the heat toward the poles. 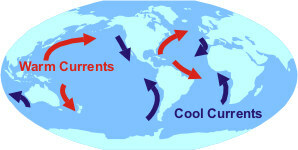 In the North Atlantic, the warm currents from the tropics feed the North Atlantic Current shown in red in the figure. As the current flows northward toward Norway and Greenland, it loses heat to the atmosphere and cools down. In winter the water near Norway and Greenland gets so cold and dense it sinks all the way to the bottom of the ocean. The cold bottom water feeds bottom currents shown in blue and green. Eventually, mixing brings the bottom water back to the surface in other parts of the ocean, sometime as far away as the North Pacific. When the water gets to the surface, sunlight warms the water, and the cycle starts over. The alternating influence of El Nino and La Nina are now well known These 3-5 year period disruptions in weather patterns are caused by the movement of warm water in the tropical Pacific, and are now predictable up to a year in advance because of a special monitoring network of ocean buoys maintained there. The North Atlantic Oscillation (NAO). Its "high index" state is shown above, this corresponds to particularly high atmospheric pressure over the Azores, an intense low over Iceland. Ocean winds are stronger and winters milder in the eastern U.S. When the NAO index is low, ocean winds are weaker and the U.S. winter more severe. 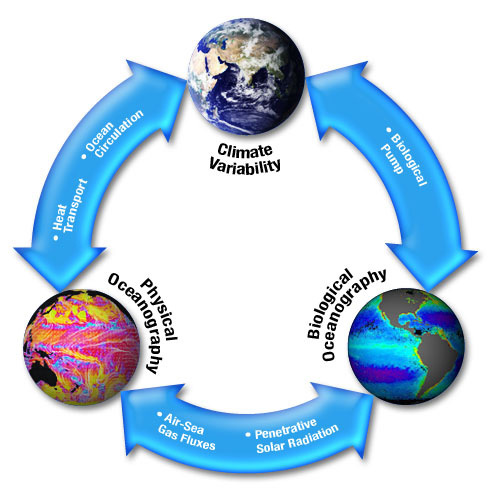 Changes in ocean temperature distributions are also observed. The North Atlantic Oscillation (NAO). When the NAO index is low, shown above, ocean winds are weaker and the U.S. winter more severe. Changes in ocean temperature distributions are also observed. Its "high index" state corresponds to particularly high atmospheric pressure over the Azores, an intense low over Iceland. Ocean winds are stronger and winters milder in the eastern U.S.